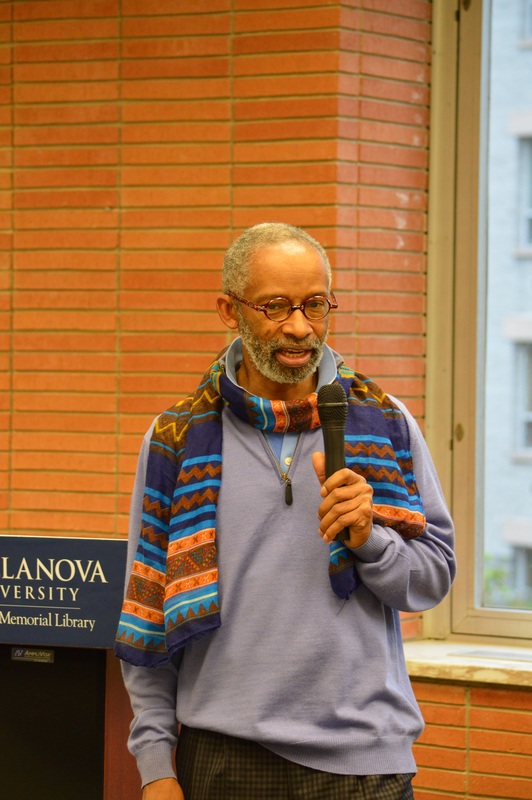 A panel of four elite Villanova University scholars participated in a discussion on “The Global and the Interdisciplinary: ‘Education and Privilege’” on Thursday, Oct. 1 at 4:30 p.m. in Falvey Memorial Library’s Speakers’ Corner. 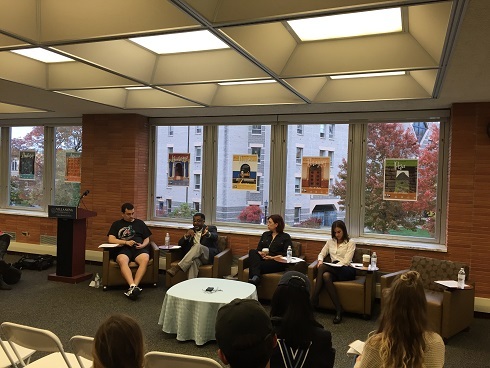 The panel, co-sponsored by The Global Institute for Interdisciplinary Studies and Falvey Memorial Library, determined the reasons why current issues of race and identity exist in society and also explored ways in which we can take action to challenge the status quo. Panelists included Jerusha Conner, PhD, Department of Education and Counseling; Carol Anthony, MA, Center for Peace and Justice Education; Jill McCorkel, PhD, Department of Sociology and Criminology; and Bryan Crable, PhD, Department of Communication. Each panelist described their perspective on why issues of race and inequality persist and the steps we can take to make a difference. Maghan Keita, PhD, professor of History and director of the Institute for Global Interdisciplinary Studies made opening remarks. 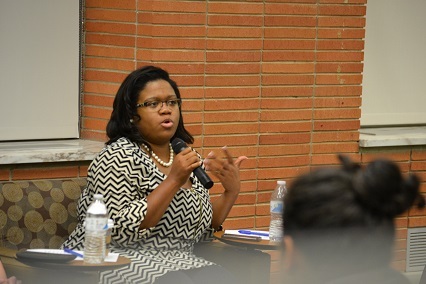 To kick-off the panel discussion, Dr. Jerusha Conner discussed her approach the problem of race integration by utilizing her background in the field of education. She stressed the need to educate and empower students to be activists in order to initiate social change. In addition, Conner cited that a group of current Villanova students participate in a service partnership with inner-city schools. By going to the core of the problem, she believes that the students are able to take action and promote change. Dr. Jill McCorkel, who actively studies the inequalities that exist in the U.S. prison system, emphasized that a vicious cycle exists for students who come from lower-income families; they tend to go from school directly to prison. Dr. McCorkel called it a “school to prison pipeline.” She believes people from certain groups are considered scapegoats and are unfairly treated. The privileged don’t always recognize this inequality. In addition, Dr. McCorkel cited her belief that forms of punishment are connected with our racial history and recommends that we explore the ways that this connection resonates with other countries. Examining the problem from a social justice perspective, Professor Carol Anthony discussed the need to question the ways we rationalize the morality of conditions in our society. She stressed reasons we should question our justification of violence and inequality as the norm. Dr. Bryan Crable, an expert in the study of rhetorical theory, talked about race, identity, power and privilege, utilizing his background in the study of communication. 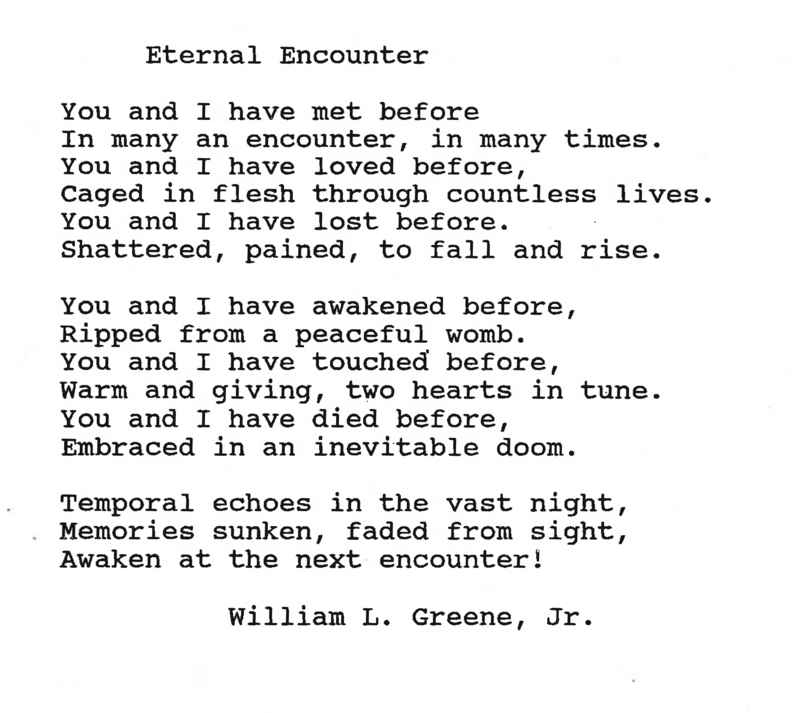 He discussed his close examination of the relationship between Kenneth Burke and Ralph Ellison, two influential American writers. 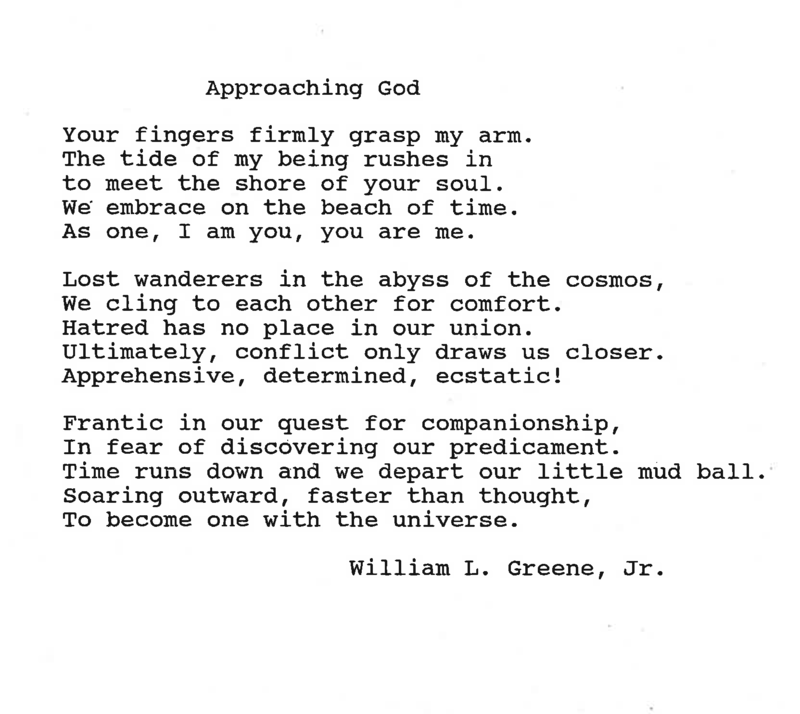 Dr. Crable views this relationship as a reflection of the racial divide that still clearly exists in society. So, what steps can we take to successfully integrate all members of society? 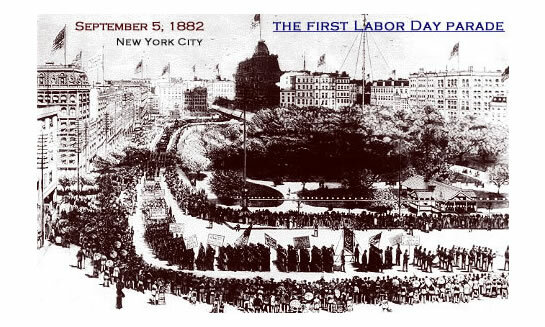 How do we avoid reinforcing the ever-present racial divide? The panelists agreed that we do a lot as a community, but that we are capable of doing much, much more. Some solutions include providing prison inmates with education, hiring more diverse students and faculty, and presenting more opportunities to students who come from lower-income families with more attention given to how racial diversity is presented in schools. 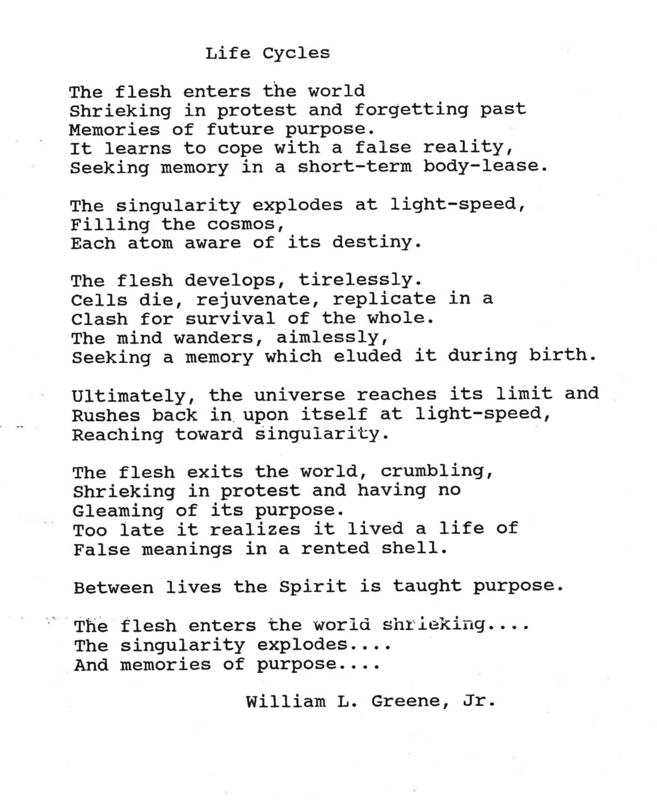 It is also important to continue to be open to learning and make a conscious effort to self-educate. They believe that with knowledge we are better suited to tackle this problem. 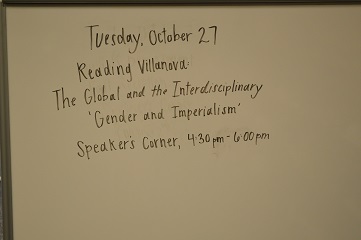 On Tuesday, Oct. 27, several elite Villanova scholars presented on: “The Global and the Interdisciplinary ‘Gender and Imperialism’” as part of the Reading Villanova series. (Click here for a quick review about what was discussed at the first event in the series on “Education and Privilege.”) The second event in the series took place in Speakers’ Corner to a packed crowd of faculty, staff and students. 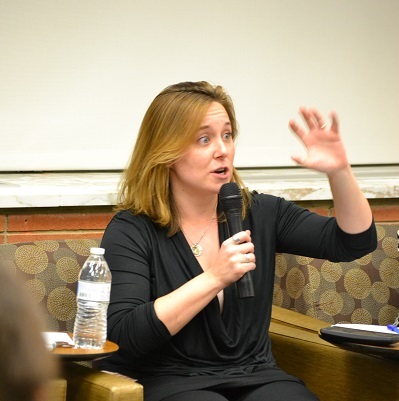 Amy Way, PhD, assistant professor, Department of Communication; Chiji Akoma, PhD, associate professor, Department of English; and Catherine Warrick, PhD, associate professor, Department of Political Science shared their thoughts at this second event in the Reading Villanova series. Yeoryios Stavris, a student of Maghan Keita, professor of History and director of the Institute for Global Interdisciplinary Studies, moderated the panel. Check out the video recording of the event here! 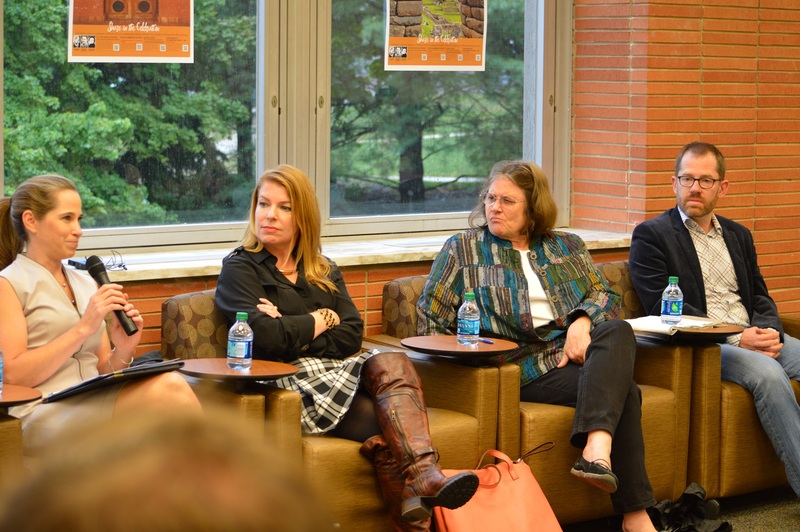 Pictured (from left to right) is student moderator, Yeoryio Stavris, Dr.Chiji Akoma, Dr. Catherine Warrick and Dr. Amy Way. 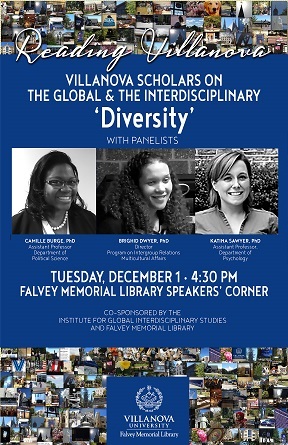 On Tuesday, Dec. 1 at 4:30 p.m. in Speakers’ Corner of Falvey Memorial Library, three prominent Villanova scholars presented: “The Global and the Interdisciplinary ‘Diversity’” as part of the Reading Villanova series. 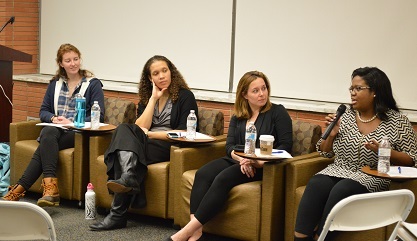 Camille Burge, PhD, assistant professor, Department of Political Science; Brighid Dwyer, PhD, director, Program on Intergroup Relations, Multicultural Affairs; Katina Sawyer, PhD, assistant professor, Department of Psychology shared their thoughts with us at this event, which was the final event in the Reading Villanova series of the fall semester. Careers in International Development Day at the Connelly Center is not your usual job fair – it’s a symposium designed for career exploration and a perfect event for students interested in pursuing careers that address global poverty and related issues. Lindsay Coates, Executive Vice President of InterAction, an alliance of 190 International Non-governmental agencies will open the day at 1:30 p.m. in the Cinema with an overview of the changes, challenges, and opportunities in the field. From 2:30-4:30 p.m. in the Villanova Room, professionals representing a variety of career paths, including the UN, USAID, Social Entrepreneurship, Impact Investing, Global Health and others will meet students in roundtable breakouts (repeating every 30 minutes) to share their professional experience and offer advice on what students need to get a foot in the door. In the Villanova Room Market Stall area, students can meet one-on-one with representatives from graduate programs, post-graduate overseas internship and volunteer opportunities and relevant VU curricular and extra-curricular programs from 2:30-4:30 p.m.
Catholic Relief Services organized and will host the event in partnership with Villanova University, the College of Nursing Center for Global and Public Health, the Villanova School of Business, the VSB Center for Global Leadership, the Career Center, the College of Liberal Arts and Sciences, the College of Engineering, the Office of Mission and Ministry and the Southeastern Pennsylvania Consortium for Higher Education. The library’s collection includes many books, article databases and statistical sources about international development. For the policy wonk, Columbia International Affairs Online includes full-text case studies, policy briefs, scholarly articles and books. Public Affairs International Service (PAIS) is an article database covering similar territory. Because international development is truly interdisciplinary, academic research on international development can be found in many specialized databases, such as PubMed for health, EconLit for economics, and Compendex or Inspec for engineering. 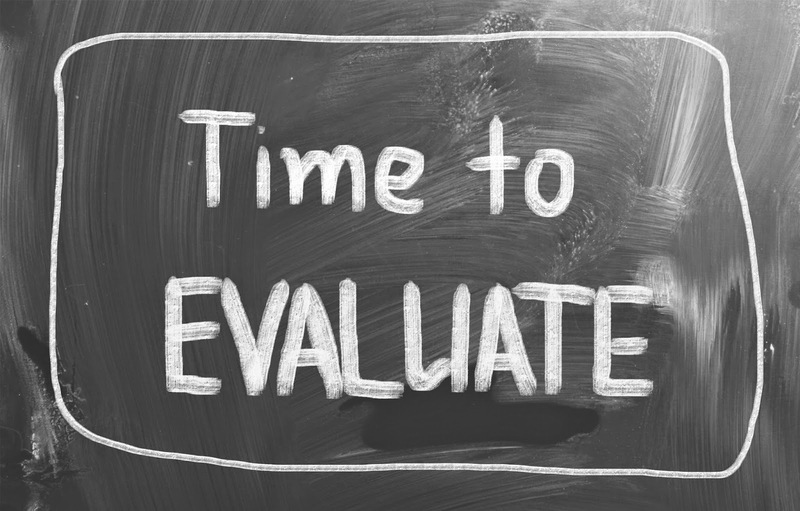 Since 1990 the United Nations has published the Human Development Report, which identifies trends in development, and the Index, which is a tool used to assess country level development in terms of life expectancy, education and income. The Organization for Economic Cooperation and Development publishes numerous books and statistical series on development in many dimensions all available in the OECDiLibrary. AidData.org takes a data driven approach to improving outcomes by publishing datasets, visualizations and reports. Villanovans across the disciplines are engaged in research on various aspects of development aid. 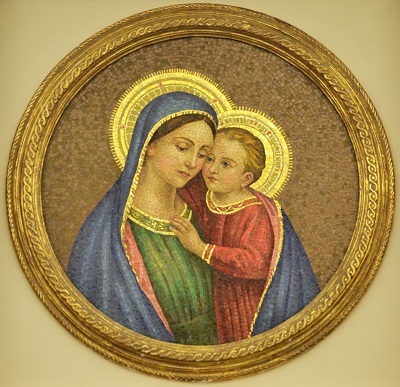 Suzanne Toton, EdD, writes about Catholic relief, world hunger and social justice. The writing of Kishor Thanawala, PhD, explores economic development and justice. Latin American Development is the area of expertise of Satya Pattnayak, PhD. Jonathan Doh, PhD, is a prolific researcher on nongovernmental organizations and global corporate responsibility. Christopher Kilby, PhD, is a thought leader on the economics of foreign aid. Ruth McDermott-Levy, PhD, is a practicing nurse, educator and researcher on international community health.